Solu-Kelp is a 100% cold processed, digested Norwegian Sea Kelp that provides a broad spectrum of nutrients, amino acids, polysaccharides, naturally occurring plant hormones, vitamins, enzymes, antioxidants, and polyphenols. Our lengthy digestion process releases all plant beneficial constituents into solution, with no exposure to heat or caustic chemical extraction. Our exclusive Solu-Plus technology is incorporated to optimize bioactivity. 100% cold processing insures that heat sensitive constituents such as amino acids, polysaccharides, vitamins, and plant hormones remain safe during manufacturing. Contains primary, secondary, and micro nutrients, as well as, trace elements to promote soil biology, enhance turf health, and re-mineralize your soil. Enhances chlorophyll formation while improving stress tolerance through available antioxidants. 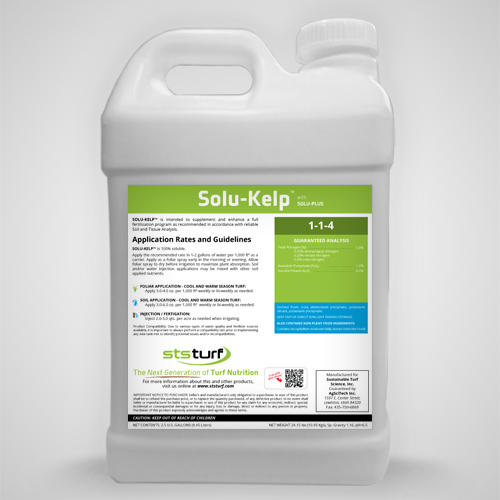 Solu-Kelp is compatible with a wide array of products including raw source materials. Injection/Fertigation Rate / Acre 2.0 - 3.0 qts.